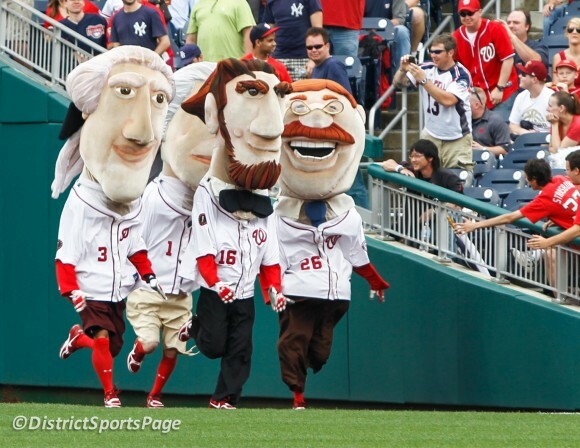 The Washington Nationals will dedicate the last homestand of the 2012 regular season to Teddy Roosevelt, one of the team’s beloved racing presidents, when they take on the Philadelphia Phillies October 1 through October 3. Known for his steadfast determination and resilience in the face of adversity, Teddy has become a fan favorite despite his inability to win a single GEICO Presidents Race in the event’s seven year history. The race is a Nationals tradition that takes place in the middle of the 4th inning during every game at Nationals Park. In addition, various pregame and in-game videos featuring special guests will air in the hopes of motivating Teddy to put forth his best effort in the final races of the 2012 regular season. For more information or to purchase tickets, visit nationals.com/teddy. The Nationals will also extend Fan Appreciation Month into October and give fans the opportunity to win various prizes during each game of the final homestand, including Nationals merchandise, autographed items from Nationals players and a variety of giveaways from the team’s corporate partners. To receive up-to-date WMATA service notifications on a mobile device, fans are encouraged to register for Alert DC at https://textalert.ema.dc.gov/. Visit nationals.com/waytogo for information on parking and additional routes to Nationals Park. Cheryl Nichols is a Columnist and Photographer for District Sports Page. She is credentialed to cover the Washington Capitals and has reported on the community service and fan events since 2006. Cheryl has been published in The Washington Post and many other local media. She was a credentialed photographer for the 2010 season covering the Washington Nationals. You can follow her on Twitter @cnichols14.